This will be a match that everyone at Annan Athletic will want to forget with the league campaign starting next weekend. The joys of Tuesday nights result against championship side Dumbarton were short lived as a rampant Ayr United side cruised to victory at Galabank. It was a disastrous start for the Black and Golds as Ayr opened the scoring within 20 seconds of kick off with Ross Docherty netting at the back post from Mike Moffat’s cross. Before Annan even had time to reflect the visitors had the ball in the net again 2 minutes later, McGuffie sliding the ball under Atkinson as he tried to close the attacker down. Annan tried to settle a bit and Omar attempted to pull one back with Annan’s first shot but it was hit over the bar. Ayr continued to look a massive threat on the attack, Crawford hit the side netting in the 8th minute before McDaid sent a shot over the bar. Aidan Smith was presented with a free kick in the 16th minute but the wall did it’s job and the chance was cleared. Atkinson had to be alert to deny McGuffie when his shot was headed for the bottom corner before the keeper pushed it onto the post. United went further ahead in the 25th minute with a solo run from Moffat finish past Atkinson from 18 yards to make it 3 nil. The visitors didn’t ease off and as half time approached Moore broke free of the Annan defence and fired United into a four goal lead with practically the last kick of the half. The second half almost started as badly as the first as McGuffie got a flick from the corner but Atkinson saved well. Annan had a chance to pull one back in the 57th minute when Aidan Smith found the ball in the 6 yard box but after the ball bobbled between him and the keeper, Hart finally held onto the ball. Ayr made it 5 in the 66th minute when ex Annan player David Ferguson flicked the ball across goal for Andy Geggan to head home. Jim Atkinson did his best to keep the score line down, pushing the ball past the post in the 69th minute. A solo effort from McDaid saw Ayr go 6 ahead as he turned inside on the edge of the box before firing home. It took a fantastic double save from Atkinson in the 83rd minute to deny both Gilmour and Geggan. 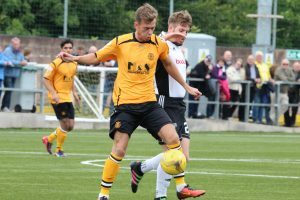 Annan finally managed to find a way through the well organised United defence with Ryan Sinnamon pulling back a consolation goal, finishing past the ex Annan goalkeeper Jordan Hart. With Kilmarnock defeating Dumbarton in the final group fixture, Annan avoided bottom place finishing above the Sons thanks to the bonus point for a shoot out victory. The Betfred Cup fixtures have gave Peter Murphy’s side a good work out in the run up to the new season but the manage wasn’t happy with todays result.